Lex Autolease and BCA combined for a special sale at BCA Bedford on 10th January, featuring 400 end-of-lease cars that included with a special selection of prestige and sporting models. The sale attracted over 300 buyers to the Bedford auction centre with a further 533 logging on to bid via BCA’s Live Online internet bidding service. Over 90% of the cars sold on the day for a £3 million-plus turnover that achieved 99% of CAP Clean. Star of the show was a 2006 Fisker Tramonto - the only right hand drive model in existence and one of just 15 built. A true supercar, the Tramonto is based on the Mercedes-Benz SL 55 AMG and was created by the Californian based company founded by former Aston Martin head designer Henrik Fisker. The car was painted in Titanium Quartz Metallic with two-tone Sand interior in finest Italian leather and finished with Aluminium and bare Carbon Fibre touches. 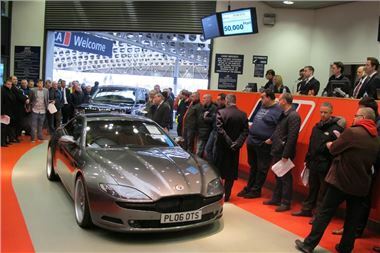 Following some very competitive bidding in the auction hall and online, it sold for £50,000, calculated as 172% of CAP. Another notable seller was the 0858 Hummer 2 6.2 Lux at 17,000 miles and finished in an eyecatching combination of orange and black with lots of chrome trim. It sold £28,850, equivalent to 112% of CAP.